Check for price and availability. 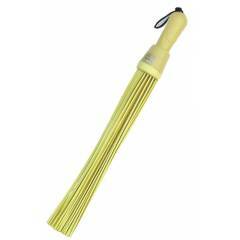 Allwin Kharata Broom is a premium quality Brooms & Brushes from Allwin. Moglix is a well-known ecommerce platform for qualitative range of Brooms & Brushes. All Allwin Kharata Broom are manufactured by using quality assured material and advanced techniques, which make them up to the standard in this highly challenging field. The materials utilized to manufacture Allwin Kharata Broom, are sourced from the most reliable and official Brooms & Brushes vendors, chosen after performing detailed market surveys. Thus, Allwin products are widely acknowledged in the market for their high quality. We are dedicatedly involved in providing an excellent quality array of Allwin Brooms & Brushes. - Is the item durable? - Is this item easy to use? - What are the dimensions of this item? No Cost EMI offer of Moglix enables users to purchase *everything on EMI and experience easy shopping. This special scheme allows customers to purchase expensive products on EMI at the original price of the product that is split equally across the **EMI tenure. The interest a buyer is liable to pay is offered as an upfront discount on checkout. So, there are no addition costs such as interest, down payment or processing fee. Moglix offers No Cost EMI on all products across the site. **Applicable on EMI tenure for 3 and 6 months only, across all banks. Twice per month during offer period. Get cashback upto ₹200 Valid only for the first transaction using Paytm Wallet. Valid from 21st August, 2017 till 20th September, 2017. Valid only for the first transaction using Paytm Wallet. Can be availed on a minimum cart value of ₹500. Cashback offer valid between 21st August 2017 and 20th September 2017.